This beef salad is delightful. It’s an authentic & old Thai dish and we don’t see nor cook it very often at home. I remember that when I was young I don’t like eating green apple-eggplant at all. Things change over time, apparently, as now I kind of like it very much. 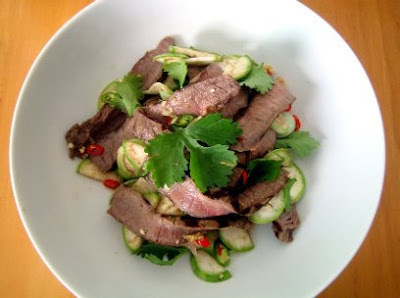 Anyway, find below a recipe of Spicy Beef & Green Apple-Eggplant Salad. Sprinkle both sides of Beef Steak with Sea Salt, then keep in the fridge for a night. Take the steak out of the fridge, leave for 5-10 mins at room temperature. Grill the steak to your liking (I love mine cooked Medium-Rare). Then keep one side, leave it to rest for 5-10 mins. Then slice into bite-sized strips. 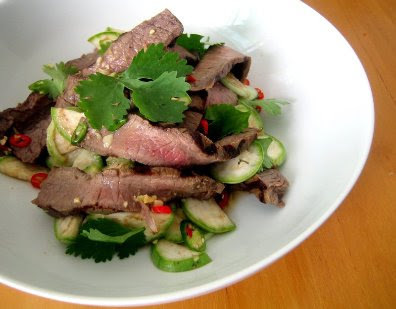 In a big Salad Bowl, add in the sliced Apple-Eggplant, Grilled Beef & Dressing. Toss to combine well. Remove into a serving plate, sprinkle with Cilantro leaves. I didn't know one could eat raw eggplant. I'll have to give this a try if I can find green-apple eggplants. I love tangy, spicy thai salads. This looks delicious!